All candidates like answering questions. And if they don’t, they shouldn’t be candidates. On our show today we give you a glimpse into what makes a candidate tick. You can learn a lot about a candidate by asking simple questions about his life, philosophy and thoughts. You’re going to enjoy this show. Today we get to talk with Austin Petersen. 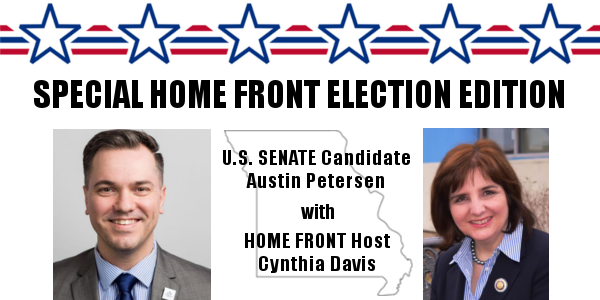 Austin ran for the nomination for President of the United States in 2016 on the Libertarian Party and is currently running for the Republican nomination to the US Senate in Missouri. Welcome Austin! No to Austin Petersen. My question would be, “If you don’t believe in God where do you get your foundation?”. He has read the Bible 6 times, why? Is he authentic? Yes. Does he lack a solid foundation? Yes. Either you are with God or against God. There is no in-between. So no I cannot vote for someone who is against God. I’m sorry, but I’ll have to respectfully disagree. The one and only reason our Founders supported Christianity as a preferred religion in the United States was because they formed a union with the intentions that the populace of the several states would be a self-policing society, and they felt at the time that Christianity could best instill a moral compass within the society. Not that any laws should reflect Divine Doctrine. To believe that American Law is the will of God sounds self-righteous in my opinion, and closely reflects how Islamic countries enforcing Sharia Law governs. If your concern about Austin Petersen is whether or not his moral compass points true, one only needs to look up and review recordings of his many speaking engagements and interviews. Marching for Right To Life; calling for communities, churches and charity organizations to play a larger role in our lives than Government; calling for a return to the family unit; stating our society is in need of better fathers. Those just morals. Morals that Austin Petersen calls for. Let us pray for Austin that the Holy Spirit will inspire him to once again find his faith in our Lord Jesus Christ and become a practicing Christian again. He is very honest and well-spoken and I think will make a good Senator but something will always be missing in what he is, says, and does until he once again accepts Jesus as his Lord and Savior.